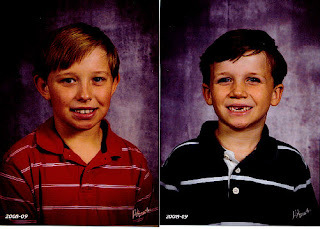 The boys came home today with their new school portraits in hand. I can't believe they are already in 4th and 1st grades. This Friday will mark the end of the first quarter already! I'm looking forward to having them home all next week for Fall Break. Blake will celebrate his 10th birthday on the 13th. Double digits...wow!